If you ask your sales and marketing departments, they’ll probably tell you they do entirely different tasks. While it may be true, sales and marketing often need to work hand in hand if you want to grow your business. Where marketing helps you attract customers and hold their attention, sales will ultimately close the deal. Without the other, neither would be able to succeed. However, trying to get the two to effectively communicate can be a struggle. With each department focusing on their own tasks, it can be challenging to effectively hand off leads between sales and marketing. If there is a disconnect, prospects may be getting lost in the shuffle – wasting your time, energy, and resources. Luckily, when you combine your sales and marketing efforts through automation, you can close the gap and bring more leads through the buyer’s journey. Communication between the marketing and sales team is crucial. In order to close more sales, leads need to be properly nurtured and educated before they’re contacted by a sales professional. Once they’ve made a purchase, that prospect needs to be returned to the marketing department for continuous nurturing. However, communication typically doesn’t happen as naturally as expected. Each department has different goals, mindsets, and processes that can cause them to miss opportunities. When the process is automated, the gap can close, ensuring each department gets the prospects they need at the perfect time. There are a few different ways you can combine sales and marketing efforts through automation. Let’s take a look at a few to get you started. Segmenting your emails allows you to better understand what phase of the buyer’s journey your leads are at. If they’re engaging with product pages, have items in their shopping cart, or frequently visit the same landing pages, identifying these individuals through segmentation can help you find prospects who are ready to buy. Lead scoring assigns a specific weight or rating to different actions and behaviors. As your leads engage with your content, points are added or removed from their score. When their score reaches a certain level, they’re assumed ready to buy and handed off to the sales team. Landing a sale depends on the relationship you build. Regardless of the investment the customer is about to make, they want to know they’re buying from someone who truly understands their needs and problems. By personalizing your messaging through marketing automation, you can establish a strong relationship before your sales department even makes contact – making their job easier. Marketing automation can help your sales and marketing departments work together more efficiently. 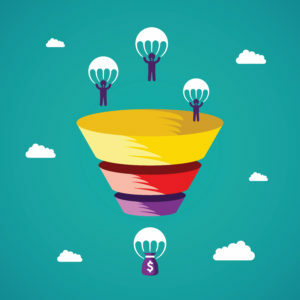 Through adding automated process and systems to your sales and marketing procedures and plans, you can reduce the number of leads slipping through the cracks and ensure each individual gets the content they need to make an educated purchase again and again.